Many scientists believe that the Earth is approaching another mass extinction event. Between deforestation, pollution, hunting, and general human encroachment, all sorts of species are at risk of going extinct. 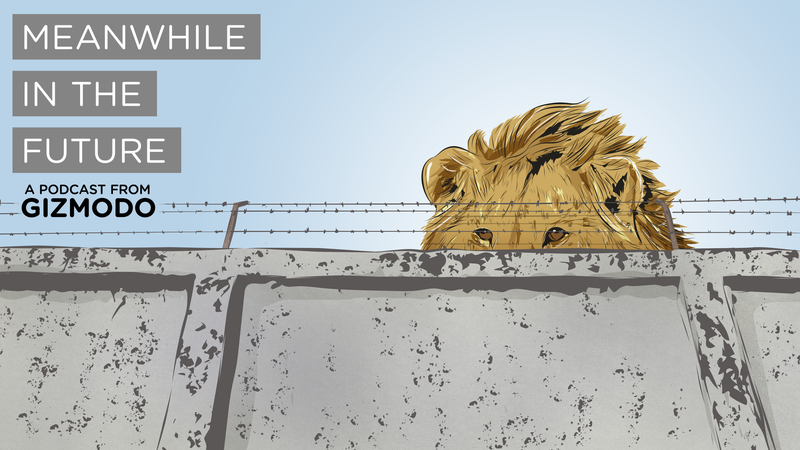 In this week’s future, humans give up on saving species where they live and instead put them in armored zoos. Let’s start with logistics. Right now there are 4,735 critically endangered plants and animals on the IUCN list. That’s a whole lot of animals and plants we’d need to build enclosures for. And, of course, we would want these zoos to be good zoos. Which brings us to our first guest this week, Dr. Vint Virga. Virga is a veterinarian who works with zoos to help animals get more comfortable. I called Virga because I wanted to know what it would take to build zoos that do a good job of keeping these animals alive and happy. Virga is famous, at least among zoo people, as someone who really gets animals. He’s the man that zoos call when their snow leopard is depressed or their zebra is anxious. Yes, both of those are real things that happen. Once the best zoos are built, then there’s the question of how, exactly, we might go about gathering up all these animals. How many do we take? All of them? Some of them? It seems absurd to try and gather up every single individual pangolin and tiger and shark. But as another guest this week, biologist Jason Goldman, points out, we’ve saved a handful of species with captive breeding like the black footed ferret and the California Condor (although neither of those efforts were without problems). Goldman is actually the one who suggested this scenario for the podcast. And he raised some really interesting questions about how the whole system might work. For example: should the animals stay in their home regions, or should they get shipped to zoos around the world? So, should the pangolins that we gather go to zoos in Asia, or to zoos in Europe? And, let’s say that we do manage to round up all the elephants and enclose them to breed them. There are a few challenges with this plan. The gestation period for elephants is almost two years and females generally wait five years in between calves. It might take a long time for that population to grow to a reasonable size. Meanwhile, as we’re trying to breed animals ostensibly to release them back into the wild, a lot is changing. We know that elephants impact their environment, so their former habitats might change completely while they’re gone. And then when we introduce them back into that environment, not only could the plants and animals and insects be totally different, but the elephants might not have the same memory of their environment either. Laurel Breitman points out that elephants have long cultural memories, in which elder elephants teach the younger ones where to go and what to do. So, to recap, it would be insanely hard to actually gather up all these animals. It would be insanely expensive to build the zoos they need to keep them happy and safe. And even if we succeeded at those two, it might be impossible to breed them and re-release them. Which brings us to, I guess, the big question. What’s the point? And here’s where we get a little bit meta — what does it even mean to conserve a species? And why do we want to do it? Bear with me here, because these are important questions that we’re going to have to answer as humans sooner than later. To talk about why, exactly, we’re so interested in conserving certain species, like tigers and elephants, I talked to Krithika Srinivasan, a social scientist who works on social, ecological and animal justice. She spends a lot of time thinking about how harm and care interact in the context of animals. And she explained that the majority of the reasons we might put forward for this plan to round everything up are anthropocentric, based entirely on ideas about what we humans think is good and important. Now, this plan might seem absurd to you. Who would think it was a good idea to try and round up all the critically endangered species and put them in zoos? Well, we would. We already kind of do. Many zoos describe themselves as places for preserving species, for breeding, for gathering DNA. Which not everybody thinks is a good way of thinking about things. So while our future probably doesn’t include a concerted campaign to go out and gather up all these animals, it almost certainly contains a continued push towards zoo-based conservation. And it definitely contains extinctions. That’s all for this week. If you have thoughts about futures we should explore on the podcast, leave us a note in the comments, on Twitter, or email us at overthinkingit@gizmodo.com. As usual, you can subscribe to the podcast on iTunes, Soundcloud or via whatever RSS reading app you chose.